Ramona Shelburne was one of the top softball players in L.A. City history and also one of the brightest student-athletes. She won All-City honors all four years at El Camino Real High School in Woodland Hills and was Co-L.A. City Player of the Year during her senior season, while leading ECR to three city titles. Academically she was the Class Valedictorian, Student Body President and National Merit Scholarship Finalist. She finished with a 4.21 grade point average and earned a softball scholarship to Stanford. Giving up her high school and club standout soccer career to specialize in softball in college, Ramona started at all three outfield positions during her four years at Stanford as the team made the NCAA Tournament all four years and the College World Series in 2001. 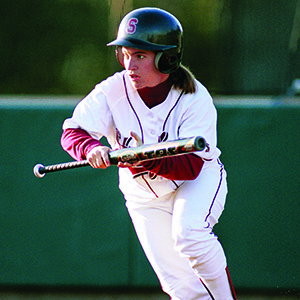 She was a three-time NFCA Academic All-American at Stanford while majoring in American Studies. She also completed a Master’s degree in Communications. During college Ramona worked on the school newspaper and interned at Sports Illustrated on the way to her current media career. Prior to her current ESPN position, she spent seven years (2002-09) at the ‘Los Angeles Daily News’ as a columnist. She presently is a respected national television and radio reporter for ESPN LA specializing in the NBA and Los Angeles professional basketball and signed a new long-term expanded assignment contract in 2016.